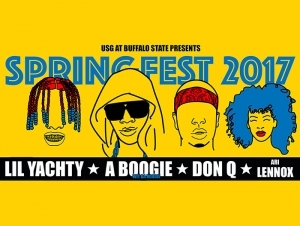 The lineup for USG's Springfest concert is set. Lil Yachty, A Boogie, Don Q, and Ari Lennox will perform in the Sports Arena on Wednesday, May 3. 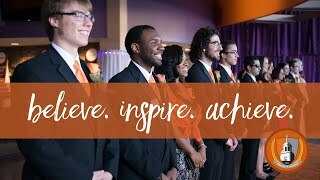 Doors will open at 6:30 p.m. with showtime beginning at 8:00 p.m.
Tickets for Buffalo State undergraduate students go on sale Friday, April 21, for $5 each (in-person only, limit one per ID) at the Union ticket office (Monday through Friday, 9:00 a.m. to 4:00 p.m.) and Rockwell Hall box office (Monday through Friday, 9:00 a.m. to 5:00 p.m.). Remaining tickets will be available to the general public beginning Monday, May 1, for $30 each beginning (in person or charge by phone at 878-3005). The concert is sponsored by USG through the mandatory student activity fee. May 1–3 marks three days of fun to close out the semester. Monday, May 1, is Relaxation and Casino Night in Campbell Student Union. From 5:00 to 10:00 p.m., casino games will fill the lobby, while yoga and zumba sessions will be held in the Social Hall. On Tuesday, May 2, from 5:00 to 8:00 p.m., the Springfest Jam will include free food, live music, and more in the Campbell Student Union Plaza.